Right now the gold should be rising so why is the gold price down? Against all logic the price of gold has remained in a 1600 to 1700 range and, even, just recently dropping below the 1600 mark. It seems as soon as it starts to reach up, wham! It gets knocked back. Perhaps the answer lies in this interesting comment by noted Analyst Chris Martenson. “As I noted in the run up to the QE4 announcement and then in the days right after, some entity has been selling literally thousands and thousands of gold contracts into the thinly traded overnight markets so rapidly that we have to use millisecond charting to see it for what it is. Again, there is no other legitimate explanation for this activity of which I am aware besides having an intent of pushing the price down. “Whether there is some motivation for this activity besides 'making money, I remain convinced that the gold market, like many others, is no longer sending useful price signals. Instead it is telling us that some entity has found it useful to sell thousands of gold contracts all at once. The main effect this seems to be having is to push out the weak willed and hesitant. Certainly the central banks and major Asian countries are not dissuaded from accumulating gold. 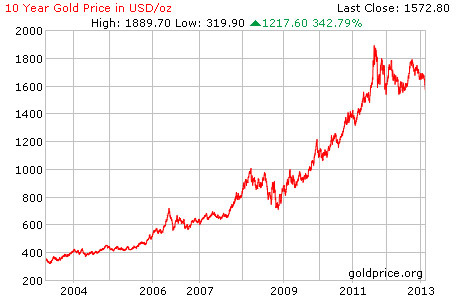 The gold price we are seeing every day in the media is not the gold price right now but the paper gold futures price. This gets glossed over and the mind set is that it is the gold price that is weak. Whereas it is simply the paper gold price being pushed down so they can buy at lower levels before allowing it to rise again and then repeat the cycle over and over again. China, for example, is buying up when the price drops and pauses when it rises. China is fast becoming one of the major holders of gold in the market place and is supplanting their holdings by buying up gold mines in order to get gold at a even cheaper price. The GOOD news is that looking at the gold price chart above, it can be easily seen that this is a similar scenario to 2008 when the gold price was pushed down heavily and yet later the following year continued its climb to the, what was then considered rarefied heights of over a thousand dollars an ounce. Apart from a peak of 900 and a low of 1550 it has steadily remained in the realm of 1600 to 1800 for close on three years so a break out is certainly inevitable and all the signs are there for a resumption in the climb towards the next level. It is just a matter of when. This could be part and parcel of why the price of is gold down, relatively speaking and maybe now is time to do as the banks and governments are energetically doing. Buying gold while it is still cheap. It is also a good idea, before one buys gold investments or shares in any public company in the gold mining sector, to really understand all the aspects of a company, who is running it, what style of management is used, what they actually do, what are their prospects, what are their assets, the balance sheet, etc. As in any type of financial arrangement, one should consult with ones financial advisors before embarking on any investment adventure. Having said that, let’s find out what sort of activities we can expect from a gold exploration and mining company. Initial prospecting is done to determine if a full exploration is warranted. A full exploration can cost many thousands, even millions so before such expense is undertaken, initial prospecting including sampling of the surface and possibly some distance down from the surface is done. It is commonly thought that any gold underground will show some traces on the surface and this is what mining prospectors look for to start with. These days, for serious gold mining, one is not looking for gold nuggets on the surface say in streams for example. That is panning for gold and is too small for a full gold mining operation. For serious gold mining one is looking for a concentration of gold within minerals, usually of a type of rock. The concentration is measured in grams of gold per tone of ore. 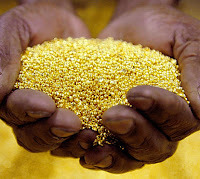 The more grams of gold per tonne the more economical and therefore profitable it is to mine the gold. How much gold is estimated to be in a particular mine or project? What is the expected gold ounce per tone of ore? The less gold extracted per tone of ore the higher the cost to extract it. This is usually measured in reports as g/mt or grams of gold extracted per tonne of ore, so 10 g/t would be ten ounces of gold produced from one metric tonne of ore. What are the production costs is another question to ask. Also how much gold is expected to be produced over the entire project? This can tell you the viability of setting up operations for that project, capital and running costs, maintenance etc. 10 g/t with an expectancy of 50,000 ounces of gold or more might be considered good all things being equal. 1 g/t with an expectancy of 100 ounces would be considered very bad. Of course these are extremes but they do indicate the necessity of getting all the relevant data and checking through it thoroughly. A MEG (Metal Economic Group) study has come up with a set of averages or guide for gold mining and exploration. In short, it is not just a matter of how many grams or ounces in each tonne of ore one can recover, it is also how big the lode or lodes are and how many thousands of ounces of gold an organisation can recover. Mining of gold is usually either open cut or underground. 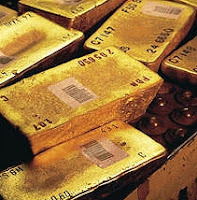 Most gold on the surface these days has been already located and mined although some pockets do get found on occasion. Most gold is mined from under the earth and this can be either a few feet down or even up to many hundreds of feet or even kilometres. Of course underground mining is generally more expensive than open cut as more energy and equipment has to be expended to shore up the mines and bring the ore to the surface. Not only that but more safety measures are required and more equipment is needed. This all has to be taken into account when assessing the cost of extracting the gold and there needs to be sufficient gold available to be extracted to make it worth while for the mining company to go forth and continue with the mining. It can be noted here that, the higher the value of gold in the market place, the more viable it becomes to mine gold that is more difficultly and costly to mine and the lower grams per tone of ore can be mined. With the price of gold 10 years ago, lower grams of gold ore would not have been viable due to the cost of mining and processing. These days, as the price of gold continues to rise, mines containing a lower amount of gold per tone of ore become more viable to mine. Important to consider also the mining company itself. Is it a public company already floated on the stock exchange? Is it a private company looking to initiate an IPO (Initial Public Offering) and list on the exchange? Who runs the company? Are they experienced in management, geology and, importantly finance? What are the governance policies of the company? What is the offer to shareholders? The history of the company. All these factors should be taken into consideration. Just finding a large deposit of gold is not enough. It has to be managed well, correctly assessed and the finances should be in place to extract the gold satisfactory and at a profit otherwise the company could go bust, regardless of how much gold they have. They could lose their license to mine or the lease hold and the gold could well end up in someone else’s hands.